Hyderabad, India (08 January 2015) – “Inclusive and demand-driven innovation is the key to fighting poverty, eradicating hunger and malnutrition, and providing environmentally sustainable solutions to the most pressing challenges faced by smallholder farmers in the drylands.” This was according to Dr David Bergvinson, as he assumed office as Director General of the International Crops Research Institute for the Semi-Arid Tropics (ICRISAT) for a five-year term effective 1 January 2015. “In tackling the poverty challenge persisting in the drylands of Asia and sub-Saharan Africa, innovation has to be driven by the demands of farmers and markets, and must recognize the important role of women and youth to enable inclusive market-oriented development,” he emphasized. Dr Bergvinson articulated his passion and commitment for smallholder agriculture, and a strong desire to improve the lives of the hundreds of millions of impoverished smallholder farmers and their families living in the drylands, as he addressed senior management, scientists and staff at the ICRISAT global headquarters in Hyderabad, India, and virtually, at various ICRISAT locations in Africa. Mapping out country strategies as a vehicle for implementing market-oriented development. In mapping out country strategies for implementing market-oriented development, Dr Bergvinson identified the need to develop an inclusive value-chain framework to deliver science-based interventions at the national level and to build stronger strategic partnerships. He also spoke of the ‘science of delivery and adoption’ – encouraging ICRISAT to lead in bringing innovations to those who need them the most. Dr Bergvinson also committed to redouble and strengthen ICRISAT’s efforts in Africa, citing the Governing Board’s decision to invest US$ 5 million towards upgrading research infrastructure and building scientific skills on the African continent. ICRISAT is committed to improving food security, making smallholder farming profitable, tackling malnutrition by focusing on more nutritious crops, and helping overcome environmental degradation across the continent. 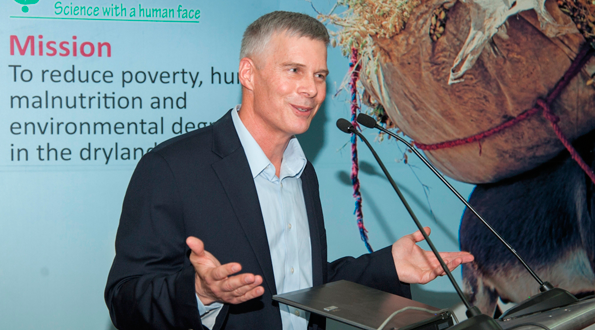 Prior to his appointment at ICRISAT, Dr Bergvinson was with the Bill & Melinda Gates Foundation in Seattle, USA, as Senior Program Officer, Crop Value Chains and Digital Design for Agriculture Development. He had been with the Foundation since 2007. He was responsible in accelerating the development and delivery of farmer-preferred products and services for staple crops in the developing world through formulating strategies, forging partnerships and applying digital technologies. He represented the Foundation on the CGIAR Fund Council. Before joining the Foundation, Dr Bergvinson was a Senior Scientist with the International Maize and Wheat Improvement Center (CIMMYT) at its Mexico headquarters for over 12 years. His research background is in crop improvement, plant biochemistry, integrated pest management, and entomology. He is no stranger to ICRISAT, having interacted with the institute's scientists on projects dealing with grain legumes, village level studies, seed systems, and digital technologies in smallholder agriculture. Dr Bergvinson, who succeeded Dr William Dar as Director General for 15 years, is expected to move ICRISAT further in generating and sharing cutting-edge global scientific innovations, and in bringing about genuine pro-poor growth and inclusive market-oriented development in the dryland tropics of the world.